In a scenario that could have been scripted straight from Geraldo Rivera’s 1986 “The Mystery of Al Capone’s Vault,” the History Center recently opened a long-hidden safe in the basement of the Old City Hall Building. The Coroner was not on standby to identify any exhumed bodies nor were officials from the IRS on hand to confiscate any uncovered riches. However, an expert safecracker from Koehlinger Security Technology did manage to skillfully penetrate two sets of cast iron doors and methodically open three separate locks to reveal a rare glimpse into the past. The Old City Hall Building housed the Fort Wayne Police Department from 1893 until 1971, before the Allen County-Fort Wayne Historical Society refurbished the building into the History Center in 1980. 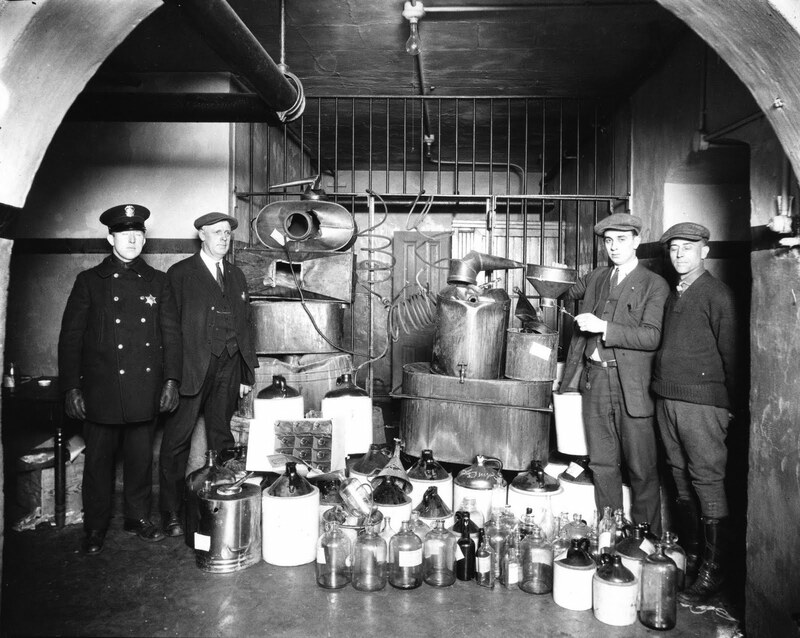 The History Center still tells the story of the FWPD through several permanent exhibits and through the carefully preserved old City “lockup,” nine iron barred cells (eight for men and one for women) that housed prisoners for nearly 80 years. Every once in a while, a History Center visitor will share their experiences of being hauled in for an overnight stay in the cells, typically when they were about 18 years of age, with a parent wishing to teach them a lesson. The accused entered the building via the Barr Street Market alley entrance, with vehicles pulling into a double stall parking garage that was first used by the FWPD’s horse-pulled prisoner wagons. From there an easy slope led prisoners downward through the subterranean processing and booking areas and into the cells. Along the way, one might have noticed a relatively small, roughly 4’ x 4’ set of heavy, black metal doors. Until recently, when the museum installed a new heating and air conditioning system, these inconspicuous, dusty and rusty double doors appeared to lead to one of the many coal shoots or circulation shafts found throughout the building. But after moving some large shelving that partially hid the safe, it was discovered that these particular doors were sealed with a large combination lock, sparking the curiosity of several staff members. Hidden safes are nothing new to the History Center, as eight large walk in safes, once used to store everything from early 19th century records to parking tickets to honorary keys to the City are known to be in the building. Several of these are entombed behind walls that were erected during the structure’s 1980 retrofitting into an historical museum. However, the unusual location and borderline abandonment of the newly found safe made it especially tempting. Conversations with FWPD retirees indicate that this safe was used exclusively by the FWPD’s Vice Department from the early 1900s until the 1970s. What might be inside these doors, which by all accounts have not been opened since at least the 1970s? Had the FWPD unintentionally left behind the relics of some notorious or seedy arrest from yesteryear? Bottles full of “hooch” or someone’s weekend “stash?” Miniature slot machines, numbers sheets, or black books? Nothing so provocative was found; however, we did find more than Geraldo. An early .22 caliber cartridge (still filled with live gunpowder), three playing cards stuck together (two fours and a deuce, perhaps 60% of a full house), a perfectly good envelope from the Police and Firemen’s Insurance Association of Indianapolis, and a few scraps of paper for reordering stationery were all found nestled in several compartments of the forgotten bankers safe that rested in the innermost layer of nearly two tons of thick metal shell. Perhaps the most startling discoveries were found on the inside of the doors themselves, adorned as they were with remarkably well preserved, brightly hand painted exotic landscape scenes and floral patterns. 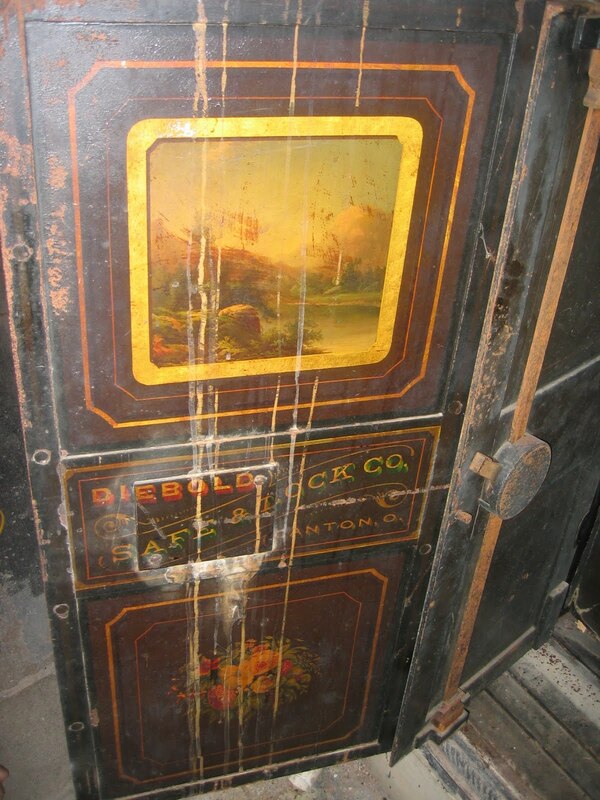 Dating from the early 1900s, the safe was made by the Diebold Safe and Lock Company of Canton, Ohio, and harkens back to a time when craftsmanship and artistry took precedence over utilitarianism and stark functionality. It is hoped that at some later date the opened safe will be added to the interpretive displays of the FWPD permanent exhibitions so that visitors, too, may experience the excitement of literally peeking into the past. The History Center wishes to give its thanks to Koehlinger Security Technology for so kindly lending their expertise to the project completely gratis. The opening of the evidence safe is certainly not the last piece of “hidden history” that will be found in the Old City Hall Building. Every so often the building gives up more tantalizing clues to the past. 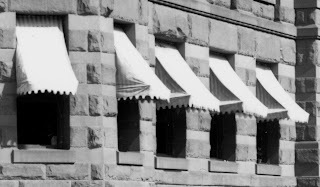 For example, for many years it was assumed, based on a turn of the last century picture of the building, that the many awnings that once lined the perimeter of the first floor exterior were a light, solid color. During the installation of the museum’s new heating and air conditioning system, longtime Curator Walter Font found tucked away in the corner of the building’s “hush-hush,” catwalked fourth floor (which is never opened for public viewing) several small slivers of the original awning. It is likely that the original awnings were stored in the fourth floor during the winter months. 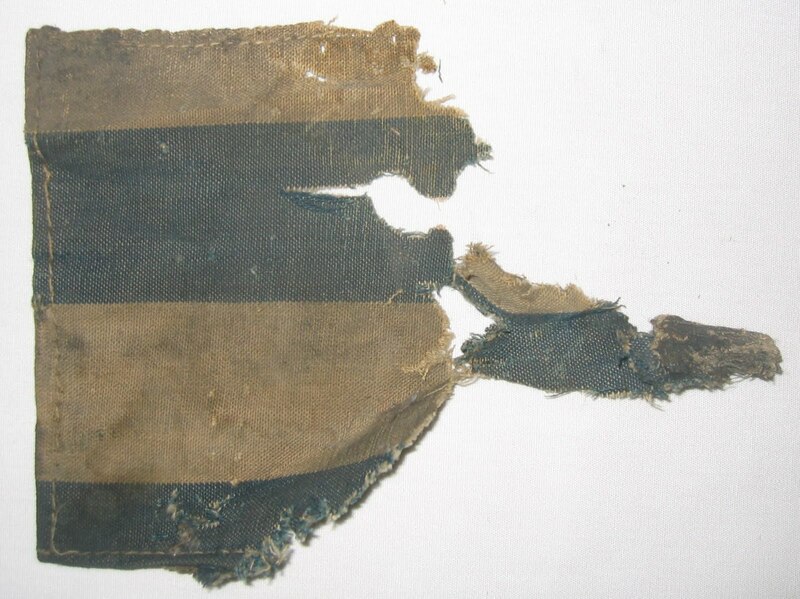 To our surprise we found the awning to have originally been a striped pattern of navy blue and dark tan. Upon magnification and closer examination of the grainy, black and white pictures, this pattern was found on the awnings within the original photos of the building. Soon the History Center wishes to replace the red cloth awnings, which have adorned the building for many years, with replicas of the original pattern. This is just one more example of how history, like the people who live it, is ever evolving and subject for new interpretation. To see more photographs related to this post, visit the History Center’s Facebook page.